Feed alone or mix with MAX™ CAT Adult Salmon Flavour Dry Adult Cat Food or any high quality dry cat food. If feeding alone, feed 1 can daily per 3 pounds of adult body weight. Refrigerate unused portion for up to 3 days. Re-feed at room temperature. Adjust as needed to maintain optimum adult body weight particularly when offering with dry cat food daily. Provide fresh drinking water at all times. 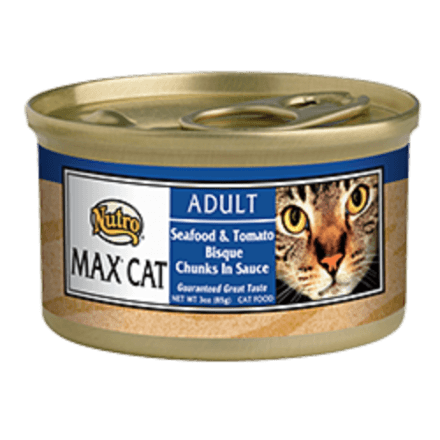 NUTRO™ MAX™ CAT Adult Seafood & Tomato Bisque Chunks in Sauce Wet Cat Food is formulated to meet the nutritional levels established by the AAFCO Cat Food Nutrient Profiles for adult maintenance.